Symb. CXII. Magnam parva facit favilla flammam. Haec pulveris inventio bombardici. From a small spark, a great flame. Thus was gunpowder invented. What happens in an emblem or symbol is an explosion of meaning ignited by the spark from the impact of a tiny picture, motto or poem coming together. 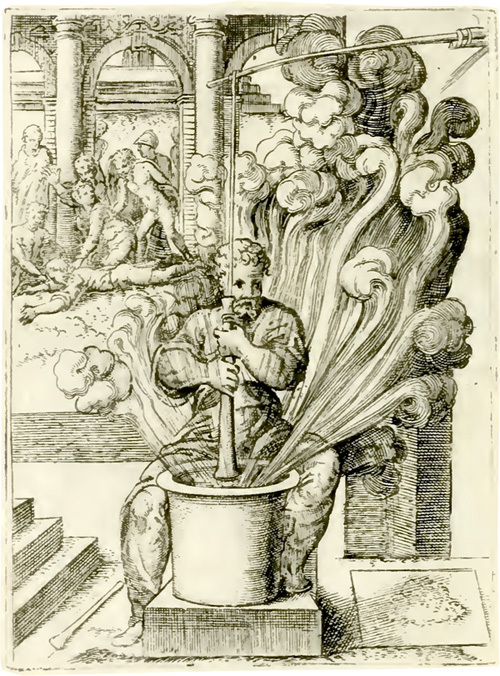 Bocchi illustrates this concept with his symbol CXIII [in a later edition] on the invention of gunpowder by an alchemist whose pestle accidentally ignited a mixture of powdered sulphur, saltpeter, and carbon. In the resulting conflagration, the alchemist himself was destroyed.